Densons Cold Shrink cable joints, cable terminations & Cold Shrink Straight Through Joints offer faster, safer and reliable installations without any hassles. For over 40 years of experience in this field, we are professional electrical workers and have trusted & advanced solutions to enhance the safety and productivity. To reduce the risk of heat shrink cable joints our Cold Shrink technology will be prove as the revolutionary alternative of traditional heat shrink cable joints. The term 'cold shrink' is used in materials, which have capability to shrink without raising the material above the temperature of its surrounding areas. Cold shrinkable cable joint is designed using high quality material in bond with industry norms. Cold shrink cable joint is checked in terms of quality for assuring its flawlessness. The Cold Shrink Cable Joints are one of the most comprehensive inventions. 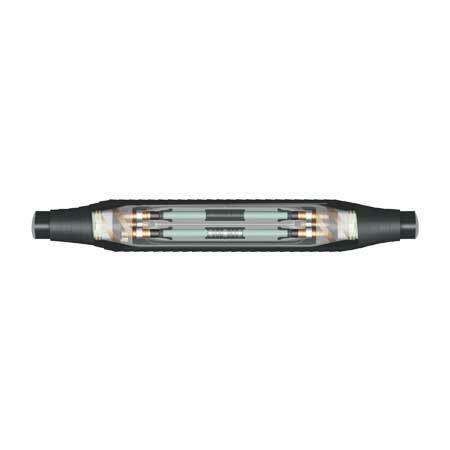 They provide as an excellent substitute to the conventional standard heat shrink cable joints. Interestingly, the cold shrink cable joints has been successfully trending in India over the past many decades. Eventually, it has gained immense popularity among the professional electrical workers. These cold shrink cable joints are highly reliable and dependable in terms of service and longevity. Also, to manage lengthy cables, there are various cable jointing accessories and cable jointing kits made available for better continuity and service. It provides faster, easy and hassle free installation process without any requirement of other equipments. Further, these cable joints and jointing kits are absolutely beneficial and cost effective. At Al Yamuna Densons, we manufacture and supply Cold shrinkable cable joints which are of international quality and standard. Our cold shrinkable cable jointing kits can easily be installed in cable ducts, under the ground, indoor, outdoors overhead, or use in cable trays. With gravity and hard work of our engineers, we have proved our place in this field by offering quality Cold Shrink Cable Jointing kits around the world. We at Al Yamuna Densons, have been dealing with the cold shrinkable cable jointing kits in India since 1973. Here, we have tasted success as one of the leading manufacturers, suppliers and exporters of the cold shrink cable jointing kits in India. We take the utmost care to maintain the quality and authenticity of our products. Therefore, the best raw materials are used for its manufacturing. There are several cold shrinkable cable jointing kits available in the market, however, our product excels in providing an outstanding performance with great efficiency. These kits are further classified based upon its application, such as pre-molded, push-on and so on. Our company, primarily deals with the three part system, i.e., hardener, resin and filler packed in bucket packs. It is recommended that the user must be thoroughly aware about the site conditions, operating parameters, voltage applications and cable types before the application as there are different types of jointing kits used for different purposes.